1 What are plants? Plants are living things that are made of many cells. They are autotrophs which means they can make their own food. They do this by a chemical reaction called photosynthesis. 2 Different kinds of plant structures move water and nutrients from one part of a plant to other parts. Some plants, such as lettuce, have tiny tubes that move water and nutrients inside the plant. Other plants, such as mosses, do not have these tubes. Plants that have the tubes can move water and nutrients farther, faster, and easier than plants without tubes. If a plant needs water, all you have to do is water the roots. 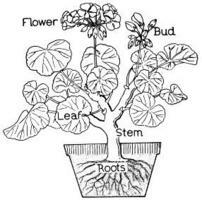 3 Plants have their own way of moving water from the ground to the stems and leaves where it's needed. Plants that move water from the roots to the stems and leaves with tube-like structures are called vascular plants. Vascular plants include flowering plants, other seed-producing plants, and ferns. Vascular tubes, or veins, carry water and nutrients from the soil to the parts of a plant where they are needed. 4 Each part of a plant has certain jobs or functions. Leaves, stems, and roots work together as a system to help the plant perform its life functions. Leaves capture sunlight and perform photosynthesis to make food for the plant. Tiny openings in the leaves allow plants to take in carbon dioxide and to give off oxygen and water. Nearly all plant leaves are green because they contain the chemical called chlorophyll. 5 Chlorophyll is used in photosynthesis, the process by which green plants make food. In photosynthesis, light energy and certain chemicals are used to change water and carbon dioxide into sugar and oxygen. The roots absorb water and the leaves absorb carbon dioxide. The chlorophyll inside the leaf absorbs light energy. The oxygen is given off into the air through openings in the leaf and the sugar is used as food. Respiration is the process by which a plant uses oxygen to change food into the energy it needs for life functions.